The iPod is a device that is so popular that even suites like CopyTrans focused on managing it appear on the market. 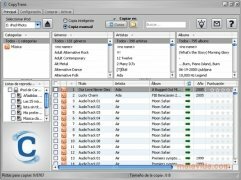 This software allows the user to use six utilities conceived to make it much easier to use any iPod, no matter what model it is. 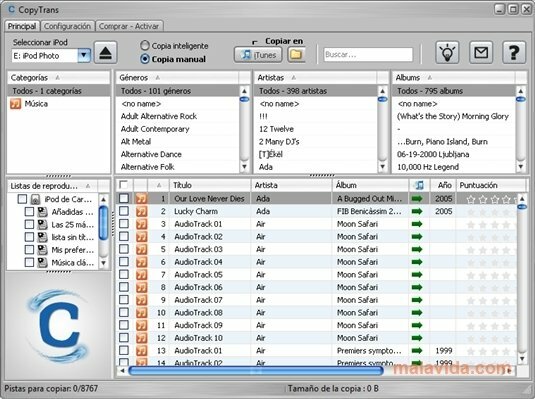 CopyTrans is much more than just an application that can transfer songs from the iPod to a PC without problems. This pack includes a series of applications that are similar to iTunes to make sure that it doesn't have to depend on the program by Apple: iCloner, to make backups; Photo, to transfer the photographs that we have stored on the gadget to a PC; iLibs, that will allow us to manage the libraries created by iTunes; and CopyTrans Doctor, the program that will help the user to find and solve any problem that the iPod may have. This software is really complete, because it includes utilities for almost any action that can be carried out with the iPod, and it's compatible with the vast majority of models, thus probably covering them all. All the programs have a unified interface, very similar to the characteristic metal interface by Apple, and their functions are really easy to find and use. This download is an installer that requires an Internet connection to finish the installation. The trial version allows you to carry out up to 100 transfers.